A passenger jet traveling from Moscow to the Ural Mountains city of Perm crashed while preparing to land early Sunday, killing all 88 people aboard, officials said. Investigators said engine failure may have caused the crash of the Boeing 737-500, which went down around 3:15 a.m. on the outskirts of Perm, about 750 miles east of Moscow. Flight 821, operated by an Aeroflot subsidiary, carried 82 passengers and six crew members, Aeroflot said. Citizens of the U.S., France, Turkey, Switzerland, Germany, Italy and Latvia were among those killed, the airline said. The U.S. Embassy said it had not been able to verify that the person listed as an American is a citizen. The plane was on its approach to land amid low cloud cover when it crashed into an unpopulated area of the city, just a few hundred yards from residential buildings. Aeroflot officials said the plane was circling at about 3,600 feet in "difficult weather conditions" when it lost contact with ground dispatchers. Authorities said there was no indication of terrorism. The most likely cause of the crash was failure of one of the plane's two engines, Vladimir Markin, a spokesman for the federal prosecutors' Investigative Committee, said in televised comments. The head of the Investigative Committee said examination of the site showed the crash "apparently was connected to technical failure and a fire in the right engine," the ITAR-Tass news agency reported. "There is much evidence for this," Alexander Bastrykin was quoted as saying. Investigators have found the plane's flight recorders and will analyze them. A section of rail track was destroyed in the crash, which scattered paper, clothing, life preservers and engine parts for several hundred yards along the track. 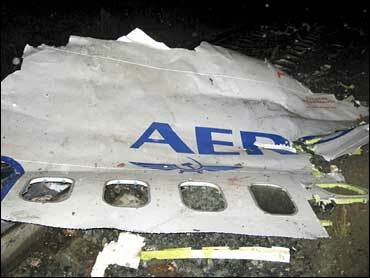 Sections of the plane's fuselage reading "Aeroflot" and "Boeing" lay askew on the rails. Part of the Trans-Siberian railway was also shut down as a result of the rail damage, national railroad company spokesman Alexander Burataeva said. "I felt an explosion, it threw me off the bed," a woman in Perm who was not identified told Vesti-24 TV. "My neighbors, other witnesses told me that it was burning in the air, it looked like a comet. It hit the ground opposite the next house, trailing like fireworks in the sky." Officials said there were no deaths on the ground. Pavel Shevchenko, a 36-year-old Perm resident who lives just 300 yards from the site of the crash, said he was awoken by an explosion and ran outside. He said a neighbor who witnessed the crash told him the plane hit the ground at a 30 or 40 degree angle. Shevchenko said he feared his acquaintances or friends could be among the dead. "It's awful. There's just no words to describe it. Perm is a small town, everybody knows everybody else here," he told The Associated Press. Russia and the other former Soviet republics have some of the world's worst air traffic safety records, according to the International Air Transport Association. Experts have blamed weak government regulation, poor pilot training and a cost-cutting mentality among many carriers that affects safety. No problems were reported with the 15-year-old jet when it was last inspected at the beginning of 2008, Aeroflot deputy director Lev Koshlyakov said. "Aeroflot has a good reputation in the field of safety," Koshlyakov told reporters at Moscow's Sheremyetevo airport, from where the flight had departed. The incident is "a hard blow for our reputation." Aeroflot director Valery Okulov said the company is ceasing cooperation with the subsidiary that operated the flight. The subsidiary, Aeroflot-Nord, will not be allowed to use the Aeroflot brand name and code, he said. "When it comes to our reputation and image, we paid too great a price," Okulov said at a later news conference at the Moscow airport. The subsidiary is majority-owned by Aeroflot but has its own fleet. Okulov said relatives of the passengers who died will be offered free tickets if they want to fly to the site of the crash. Eighteen relatives flew Sunday from Moscow. Among those reported killed was Gennady Troshev, 61, an army general who commanded troops in Chechnya. Human rights activists had accused him of tolerating rampant abuses in the war-ravaged republic. He was dismissed from his post in 2002 by then-President Vladimir Putin after he publicly refused to accept a transfer during a power struggle within Russia's armed forces. Troshev was traveling to Perm to attend a wrestling competition, news agencies said. Sunday's crash was the second involving a Boeing 737 in the former Soviet Union in the past month. A Boeing flying from the Central Asian nation of Kyrgyzstan to Iran crashed shortly after takeoff Aug. 24, killing 64 of the 90 people on board. The pilot of that plane has been detained by prosecutors in connection with the investigation, officials said this week.